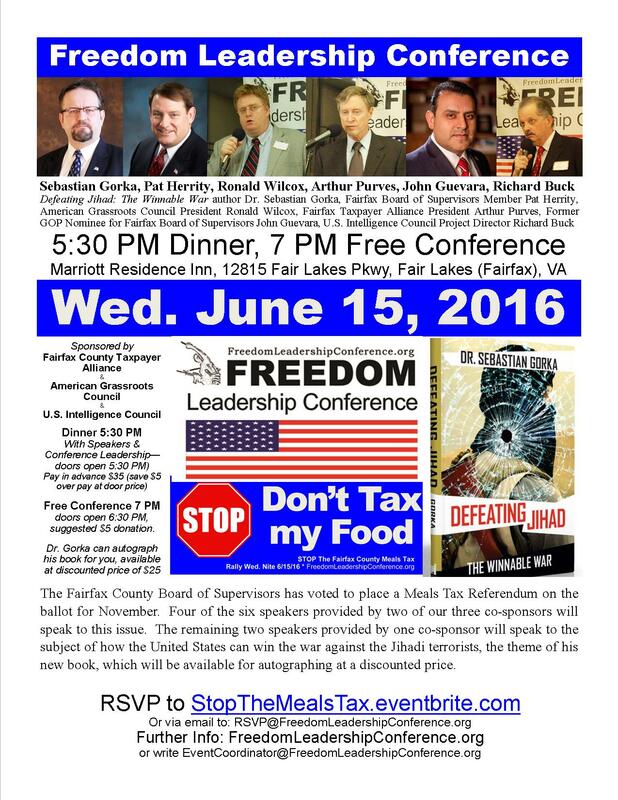 The speakers lineup for the Freedom Leadership Conference of next Wed., June 15 has been announced, with six speakers addressing two different major issues: the Meals Tax Referendum approved by the Fairfax County Board of Supervisors this past Tuesday, and the continuing Jihad Terrorist war against America. 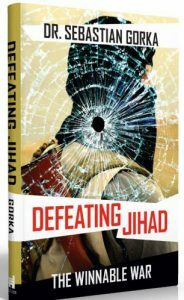 Dr. Sebastian Gorka, a frequent commentator on Fox TV and the author of the new book, Defeating Jihad: The Winnable War, will speak in behalf of conference co-sponsor United States Intelligence Council, together with USIC’s Project Director Richard Buck. A limited supply of his book will be available for purchase and autographing at the discounted price of $25 (list price is $27.99). Those who attend the dinner with Dr. Gorka, the other speakers and the conference leadership will have priority in obtaining the book. 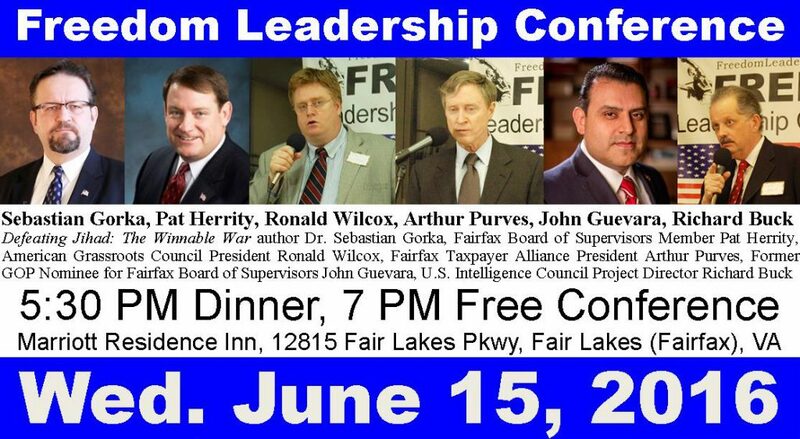 Fairfax County Board of Supervisors Member Pat Herrity, who has fought the meals tax passed by his fellow Supervisors, together with former GOP nominee for the Board of Supervisors, John Guevara, will speak out against the meal tax, with additional comments and introduction by conference co-sponsors, Arthur Purves, President of Fairfax County Taxpayers Alliance and Ronald Wilcox, President of American Grassroots Council. Herrity will only speak to the smaller conference dinner preceding the actual 7 PM conference. The very reasonable dinner price can be further reduced by an advance purchase of only $35 (save $5 from the at-the-door price – an RSVP is a strict requirement either way). Dinner begins at 5:30 PM with all the speakers and the conference leadership with doors open at 5 PM at the Marriott Residence Inn, 12815 Fair Lakes Parkway, Fair Lakes (Fairfax) VA. The Conference starts at 7 PM (doors open 6:30 PM) and is free with a suggested donation of $5 at the door to help pay for the room rental. Those who have purchased dinner tickets will have advance, preferred seating, at or close to table of the speakers. Dr. Gorka will deliver informal and off-the-record remarks exclusively at the dinner and will then speak on the record as one of the three conference speakers after 7 PM. 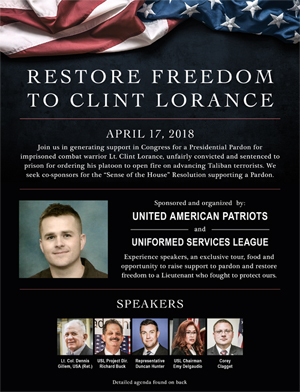 He will return at the Wednesday, September 14 Conference as the keynote speaker, sponsored by United States Intelligence Council. To purchase a dinner ticket, or make a reservation (and pay the slightly higher cost at the door) or to reserve a free conference ticket, click HERE (StopTheMealsTax.eventbrite.com) or write RSVP@FreedomLeadershipConference.org providing your full name, email, and what you would like to reserve (dinner or the free conference). There is a discount for couples attending the dinner. We would very much appreciate finding several one Conference Host Committee Chairman (donation $250) and three or more Conference Host Committee Members ($100 each), whose donations will help pay for Conference promotion to boost attendance. Those who helped in this fashion for the February conference helped us recruit a standing room only sized audience. The advertising done also helped create sold out movie theater for the new movie 13 Hours: The Secret Soldiers of Benghazi. 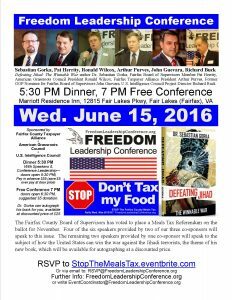 If we had $1,000 or more in donations for similar promotional advertising (principally on Facebook to reach known conservatives there) it would help both in our anti-Meals Tax advertising as well as promotion of this conference. We are in search of additional sponsors for future conferences (Primary Sponsor $1000, Sponsor $500, Co-Sponsor $250) in September, October and November 2016. All except the November conference will be at the Fair Lakes Marriott Residence Inn. For additional information or to schedule a phone call write EventCoordinator@FreedomLeadershipConference.org. A conference flyer can be viewed or downloaded and printed HERE.